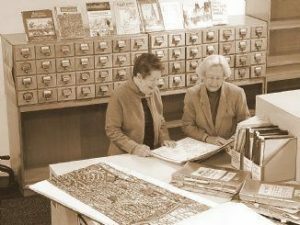 This photo shows two members in the Local History Room at Hawthorn Library. The room is packed with material on Hawthorn – publications, photographs, maps etc, and a great place to browse. 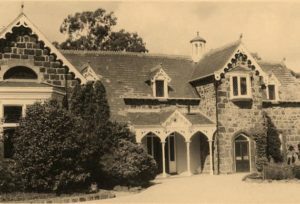 The Hawthorn Library is the oldest of the Boroondara Libraries. In May 1860 Michael O’Grady, then Chairman of the Boroondara District Road Board, suggested the Public Library be approached for books to be held in the Road Board office. By July of that year, Hawthorn became a separate municipality, with books in the new Hawthorn Free Library. The Hawthorn Literary Association helped with the Library that was in a new Town Hall room in October 1862 and later moved to an upstairs room in the new Town Hall in 1888. By 1911, the library with 5,5000 books (including 1 reference book!) moved to the Post Office part of the Town Hall. 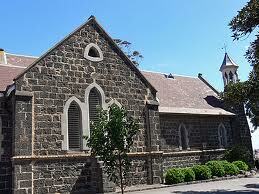 The library moved to its current location in the 1960s and is still looking after the Hawthorn Historical Society. A wonderful idea of Dorothy Sutherland to create an aboriginal food garden began as part of a Bush Tucker Trail. The garden is named after one of the clans of the Woirurrung tribe, who claim land by the Yarra River. 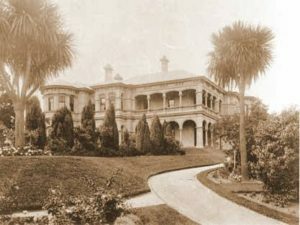 The Gardens were a joint project of the Hawthorn Historical Society and Hawthorn Council. Members of the Society removed the rampant onion weed and ivy and in the process uncovered part of a bluestone wall whilst being watched by willy wagtails and the occasional fisherman. 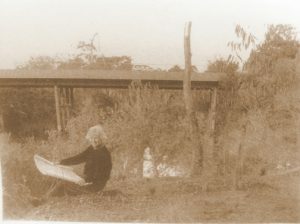 This photo shows Dorothy in the area before planting began in 1990. 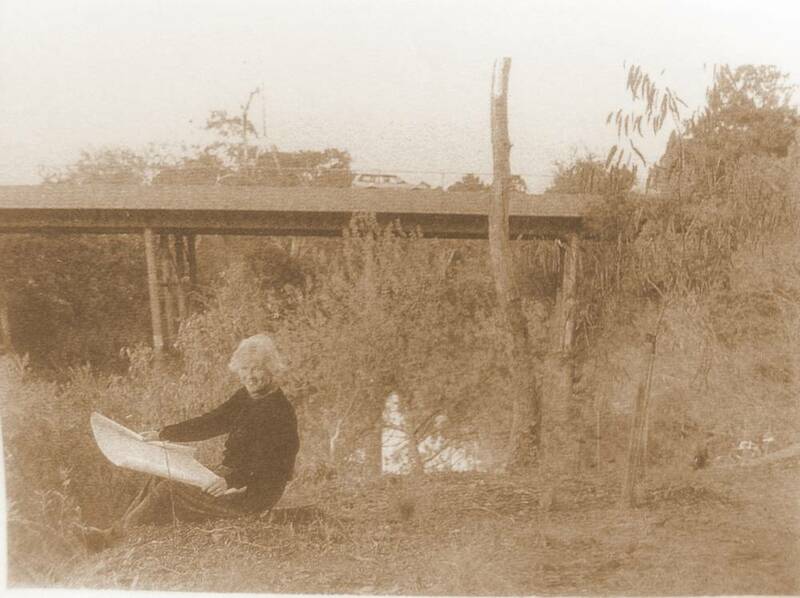 The garden was named in 1991 and by chance is situated beside the main outlet once referred to as the Boroondara Creek. 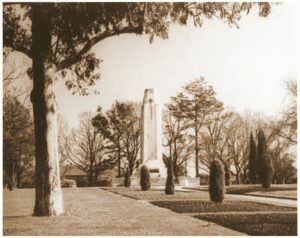 The War Memorial is on part of the original Village Reserve, with small lots further east either side of Lennox Street sold as the village of Hawthorn in mid 1852. Part of the reserve was intended for churches, courthouse, parks or public use. Fifty pines, eighty elms and twenty seven oaks were planted by 1870. The land was then offered to the Anglican Church after part of their property was taken for the extension of Denham Street through to Church Street. In 1911 the Church offered the land to the Hawthorn Council for £350. In 1921 trees were planted by the then Hawthorn Central School ‘in memory of the fallen ex-student soldiers’ after World War 1. These were by a road (once planned to continue Lennox Street through the park) later named Honour Avenue. The Memorial was paid for by public subscription and was unveiled by Lord Somers in 1929. The dead of the two world wars are now listed on the Memorial and in recent years it was restored with names added from campaigns in Vietnam, Korea, Malaya and Borneo, at the suggestion of Dr. Bernie Dunn. A local school started at the end of 1852, in a cottage near Barkers Road and then another near Yarra Street. Assistance, in the form of seats, books and money was given by St Stephen’s Church, Richmond. 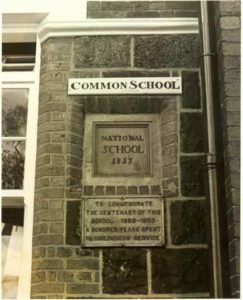 After a public meeting in January 1853 a letter was sent by James Palmer to the National Education Board requesting support for a school and a site was granted at the west end of the Village Reserve. The plaque commemorates Hawthorn National School’s beginning, with a foundation stone laid in November 1853its opening in 1853, by Sir James Palmer. A first building opened on the hill in February 1854 with Palmer suggesting drawing and music masters as an inducement to parents. Children walked to school from Richmond and as far away as Auburn Road. The school has had numerous name changes -Hawthorn Common School No. 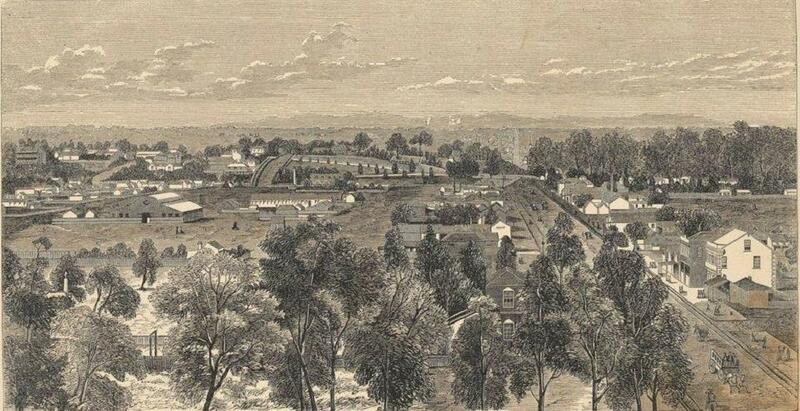 293 in 1863 with 275 pupils and Hawthorn State School in 1872 with 500 pupils. When Glenferrie School opened numbers dropped, however by 1888 it had 900 pupils (with an average attendance 520). In 1918 it was Hawthorn Central School and finally Hawthorn West with the Hawthorn West School still saying “Hawthorn West is the Best”. Over the years most of Hawthorn’s larger creeks became drains. They were tidied, straightened, lined and fenced, and although some still remain many remain buried. Major work was done on Gardiner’s Creek between 1891 and 1915. The main drain perhaps was once Boroondara Creek. This council photograph is probably the present Fritsch-Holzer park, with drainage works for the creek near Camberwell Junction assisted by the Fritsch Holzer firm. 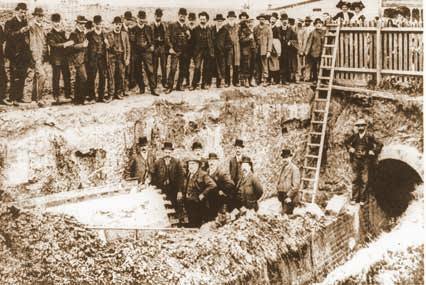 Parts of the main drain running through Hawthorn are still visible, but just imagine climbing down this ladder in suits and top hats to inspect work on the drain in 1909. 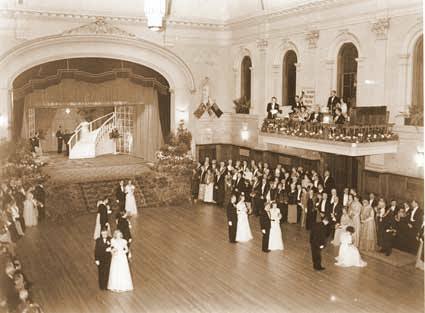 The Town Hall building was designed by John Beswicke, and opened with a grand ball in October 1889. In 1911, architect John Koch designed extensions and renovations, with a balcony in the hall, new decorations and a clock in the tower. in 1930 Stuart Calder designed additions – a new Council chamber, new upper foyer and entrance portico. Weekly dances (Saturday nights), debutante balls, concerts, wedding receptions, soup kitchens, immunization programs and more recently craft markets are just some of the activities which have taken place in the beautiful ballroom of Hawthorn Town Hall. In 2013 the Hawthorn Town Hall is currently undergoing a $17.9 million refurbishment as a key Boroondara Arts and Cultural facility, with new amenities, including meeting rooms, exhibition and workshop spaces and a café. The house was built as Warrington for Robert Robinson 1891/2. It had 12 rooms and 22 acres of land in 1893. Frederick John Cato (of Moran & Cato fame) bought the house and moved to it with his family in 1895. The name Kawarau comes from the name of a New Zealand river. Much later it became “Stephanie’s Restaurant” for some years. It is now occupied by Alia College. Frederick Cato’s daughter wrote a book about the family. She contacted the Historical Society about names of Hawthorn streets. With the possibility of a brick works on the north part of the original Tooronga estate her father bought the property. 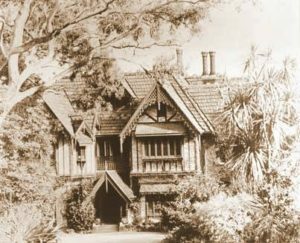 It was partly subdivided as Tooronga Heights before WW1, with street names for family, friends and New Zealand place names, Starting with B for streets east and west and L for those north-south. In 1934 the present Cato Park was donated to Hawthorn. 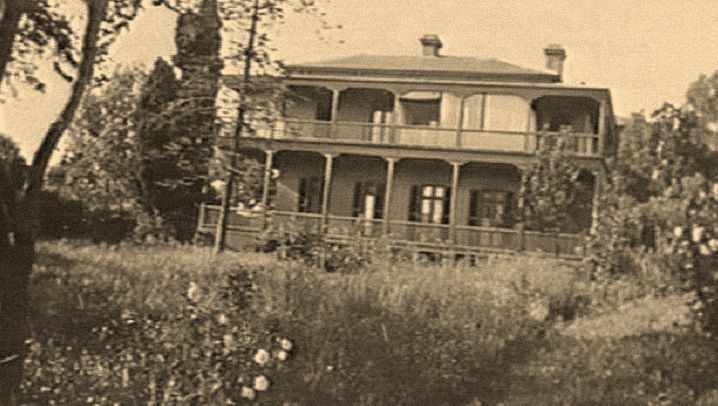 Tay Creggan, 30 Yarra Street on the banks of the Yarra River, was built in 1892 and was perhaps intended by architect Guyon Purchas to be his own home. However it was tenanted during the 1890s depression, then the McKean family before World War 1 and then the Mortells. Later it was owned by the Roman Catholic Church and occupied by the “Ladies of the Grail” from 1939 until 1969. Now owned by Strathcona Baptist Girls Grammar School it is used for a Year 9 campus. The roof and detailed chimneys were restored in 1993 and boatsheds built near the river. Christ Church Hawthorn, designed by Charles Vickers, is heritage listed by the National Trust of Australia. It is one of the earliest surviving suburban churches. The foundation stone of the church was laid on 19th November 1853, by Governor Charles La Trobe, who also donated the font in 1854. The Organ and bell were presented to the church by prominent Melbourne businessman Sir James Palmer, MLA, who lived nearby. The church is noted for its elaborate wooden chancel screen and many fine historic stained glass windows including those by local craftsmen Ferguson, Urie and Lyon. The bluestone Gothic style Anglican church is situated picturesquely on the hill at the corner of Denham and Church Streets. 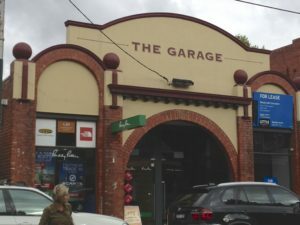 The former Hawthorn Motor Garage at 735 Glenferrie Road is classified by the National Trust of Victoria. 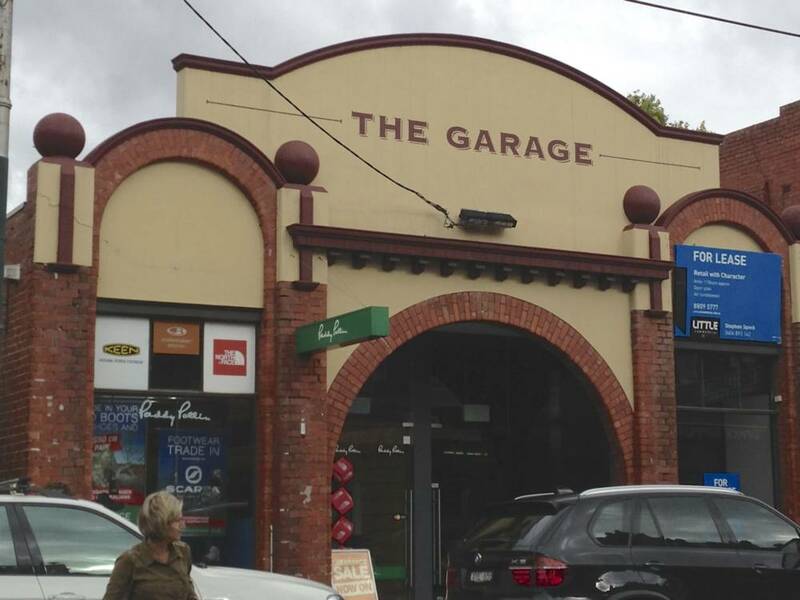 It is now the oldest, surviving, purpose built garage in Victoria. Designed by Christopher Cowper a prominent Hawthorn architect, it was built in 1912 for auctioneer Ernest Hill. Essentially a long brick shed with a decorative face brick and render street façade, the main business was the storing, washing, repairing, hiring and selling of cars. In the days before kerbside bowsers it also sold petrol in cans stored inside, but this was a sideline to the main business. James Pearson was the first postmaster in Hawthorn 1/1/1854 in a store near the present Hawthorn Station. Then Henry Dickson became postmaster, followed by Charles Nicholls 1863 with a post office and drapery store just east in the Hawthorn village. Over the years the Post Office moved numerous times, each time further east along Burwood Road and by 1872 the post office had been built by the Town Hall. In 1908 the new Post Office was in this building on the corner of Burwood Road and Kent Street with William John Constable as the Postmaster. The Post Office remained here for over 80 years. The name Hawthorn dates back to the first government village plan drawn by Albert Purchas in 1851 and confirmed by Surveyor Robert Hoddle in 1852. It was Hawthorn in official documents but then Hawthorne (possibly from a local hotel in 1853), in newspaper advertisements for land sale and the first Hawthorne Post Office 1854. It was said that Governor La Trobe stood on Richmond Hill with pioneer James Palmer and saw bushes across the river like hawthorns of “old England’, hence the name. Recently there has been a suggestion that the name came from the pioneer John Gardiner’s Irish homeland. The first Hawthorn village blocks for sale in June 1852 were either side of Lennox Street and east of the curving creek near the present Barton Street. Invergowrie at 21 Coppin Grove. The foundation stone was laid in 1850, with the bluestone house still unfinished a year later. 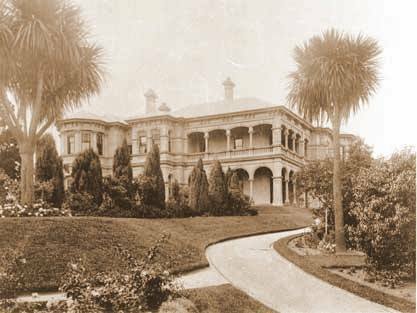 It was built for James Palmer (later Sir) but like his older house in Richmond, was called Burwood, creating confusion with the same name used for the nearby road, store and then distant village. Palmer also had a house built at Kew, but stayed at Burwood, adding a large single storey extension after he was knighted in 1857. Following Palmer’s death, the property was subdivided in 1871 by George Coppin and known as St James Park. Sir William McPherson lived there briefly in 1898, then the house was advertised ‘for removal’ in 1907 and he bought it for £5000. He restored and extended the house, renaming it Invergowrie. In 1934 it became Invergowrie Homecrafts Hostel, the first ten years were rent free, then it was donated in 1944. Ladies were taught country housekeeping – cooking, cleaning, entertaining and marketing. By 1973 student numbers had declined and it became State College headquarters. Some early Hawthorn Historical Society meetings were held here before the Headmistresses Association sold the property in 1989. It is now in private ownership again. 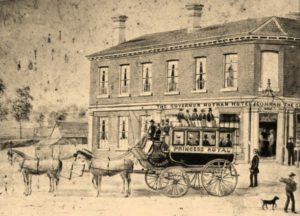 One of Hawthorn’s first hotels it has been continuously operating for over 150 years! 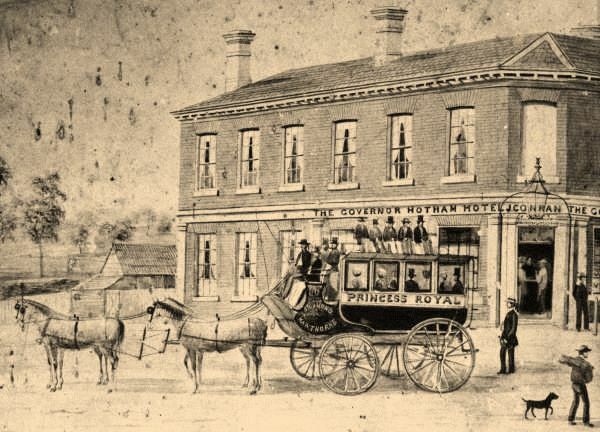 Governor Hotham Hotel at 481 Burwood Road was named after Sir Charles Hotham, who was Lieutenant Governor of Victoria in 1854. Built in 1855, and owned by John Conran, it was licensed in April 1855. Ironically it was built on land belonging to Reverend William Liddiard and advertised for sale as Auburn then Upper Hawthorn. 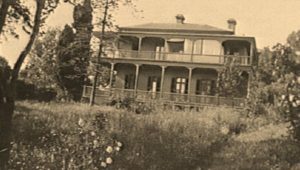 When built it was one of 8 local hotels (four then along Burwood Road), but was the grandest and more convenient for local residents and with accommodation for travellers. The hotel was the site for many significant meetings on tolls and local elections that were instrumental in the development of Hawthorn and Boroondara. In 1862 it was in the name of Sarah Conran, then Thomas Mulcahy 1873; extended in 1883; William Salway 1889; and owned by J. W. Curry in 1910. The name was changed in 2006 to the Hawthorn Hotel. Grace Park is one of the most significant properties in Hawthorn. 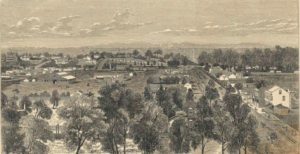 By 1848 Michael Lynch had bought Crown Allotments 38-42 (c 40 hectares/102 acres) bounded by the present Power Street, Burwood and Glenferrie Roads, and north back fences of Mary Street. Grace Park was presumably named after Lynch’s wife Julia Lynch (Grace). The family occupied the property by 1853, with then a grand new house designed by architect john Gill in 1858, as 8 rooms with a coach house, stables, servant rooms and cellar. It had grown to 18 rooms by 1870 and after Lynch’s death was occupied by Mrs. Robert Colvin Clark’s Ladies College in 1874. The estate was left to Lynch’s son Michael to be “retained in perpetuity’. However the family decided to sell, with land for the railway in 1882, and then leasing the property to Henry Byron Moore in 1884 for 50 years. The Grace Park Estate was subdivided in 300 lots but the leasehold lots were slow to sell. The Estate has some grand Victorian homes, but more from the Edwardian era, on unusual curving crescents and parkland along the old train route to Kew. 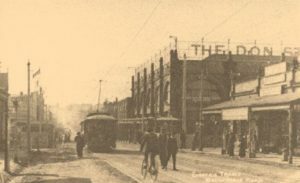 This photo shows the electric tram close to the railway crossing in Glenferrie Road near the station and the Don Department store c. 1910. The photo was taken before the railway line was raised in 1919. Following the original horse drawn tram service which operated from 1890 the Prahran and Malvern Tramways Trust commenced their first electric tram route along Glenferrie Road on 30th May 1913. This was the first such service in the Boroondara area and the first operated between Barkers Road and Malvern Road. In 1914 the Hawthorn Tramways Trust was formed to provide continuous routes throughout Hawthorn and new lines came quickly from the river bridges near Barkers Road and Riversdale Road in 1915. In 1918 the State Government established the Melbourne and Metropolitan Tramways Board (MMTB) which took over the operation of Melbourne’s trams in 1920. There are references in early newspapers to fire brigades from Melbourne and Richmond coming to fires in Hawthorn in the 1860s, police also being summoned, and the need for a local fire station again mentioned in 1872. The Hawthorn Voluntary Fire Brigade was formed by 1879, with their rooms under the tower at the back of the Hawthorn Town Hall. There were once hooks above at the top of the tower that were used to hang and dry the hoses. The Metropolitan Brigades Board purchased land for a dedicated Hawthorn Fire Station in 1892. However due to the financial crash of the 1890’s the building was not completed until 1910 whereupon it became the Hawthorn Fire Station. It was opened officially on March 11 1910. 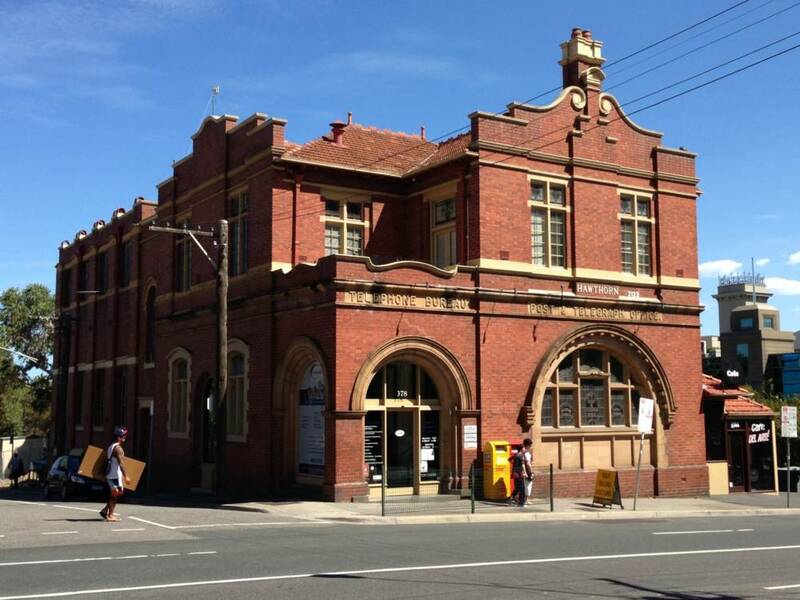 The fire service operated on this site until 1997 and the building is rated by Heritage Victoria as “architecturally significant and historically important to the State of Victoria. It remains intact and is now dwarfed by adjoining Swinburne University buildings.